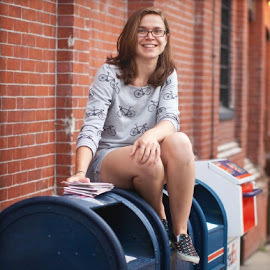 First up was a round of graduation announcements for a Northern Arizona University undergraduate. These were my first adventure into printed products, and it couldn't have gone any better. I pulled from a specific pallet to match the school colors, and used a very simple border design to compliment the rounded corners of the card. Choosing the correct font style was also an important decision, as it needed to fit in to the brown-paper-packages-tied-up-with-string, favorite things (minus the edelweiss) aesthetic I was going for. Eventually, I settled on something formal, yet light-hearted and hand-written--a thin and short, cursive text (unfortunately the name of the font is escaping me at this moment, but I will add it as an edit at a later time). Finally, to incorporate the hands-on element, I used textured white card, tied with a neutral hemp yarn (to emphasize the printed colors), and a grooved, brass-colored button to make it "pop" (a very technical crafting term, clearly). Each card was then delivered in a navy envelope, and a gold paint-pen was provided for addresses (not pictured). 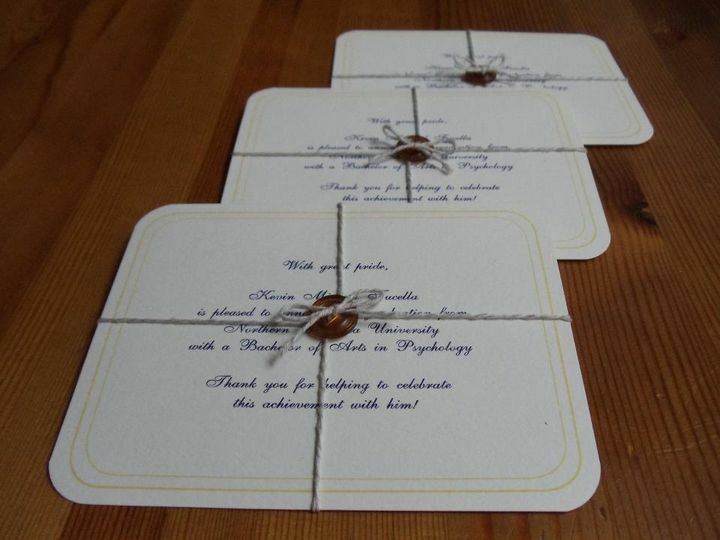 This style is great for event announcements, as the tied package design is ideal for keeping multiple information cards together; or as a way of giving texture to a single card, as exemplified here. 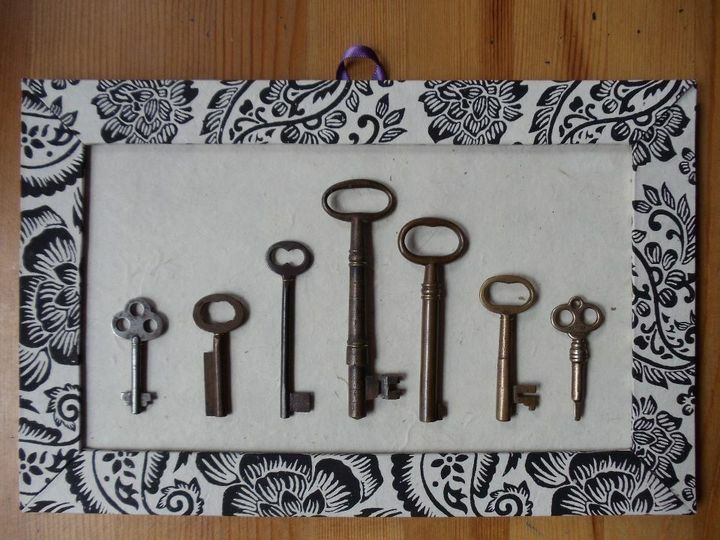 Next up was a graduation gift combining a hanging frame with the individual's interest in antique keys. 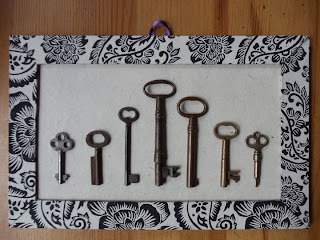 I had found an amazing array of old brass keys (check out Village Renewal in Brookline Village, MA for a variety of treasures), and the premise of this combination came from wanting a nicer way to present and display them than by the handful, but still having the option to take them out and enjoy them individually. 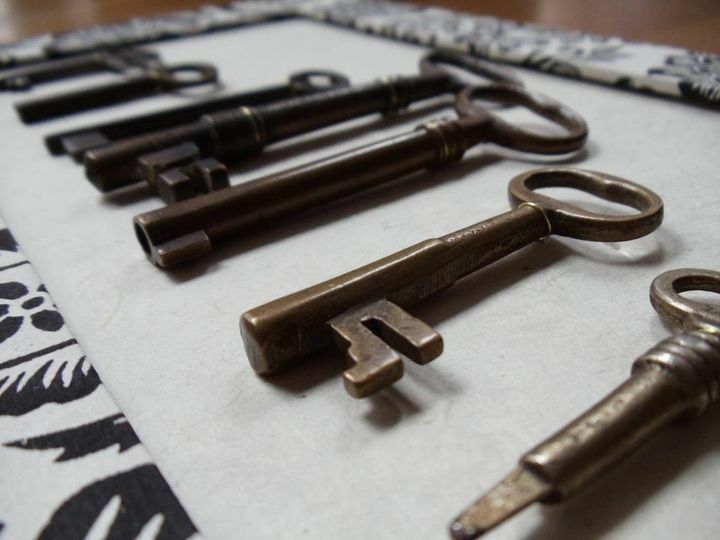 What I settled on was a retractable frame with wire ties that would allow each key to be held inconspicuously and removed easily. 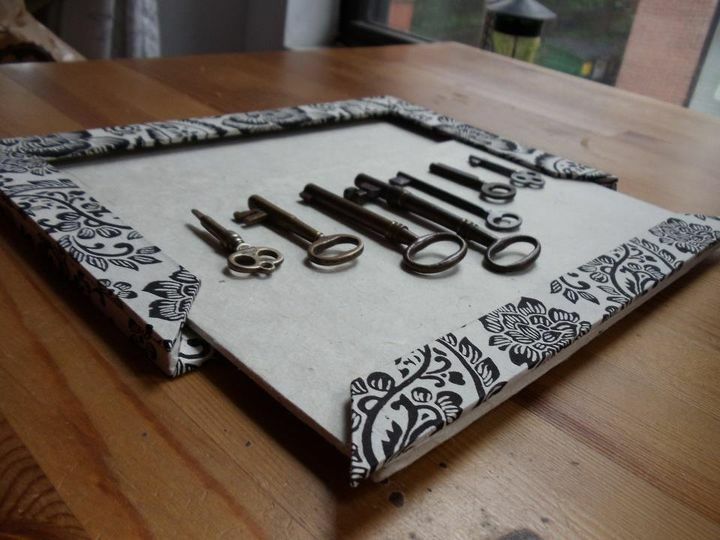 It's a pretty simple construction involving a base layer, some inner scaffolding, and an outer frame (the tray involves the same), all covered much in the same way as one would approach book binding, using two different hand-made decorative papers. 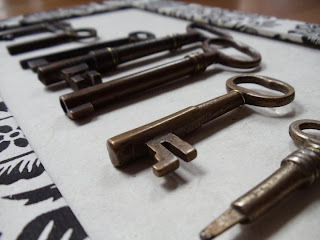 I installed the ribbon hanger through an incision in the base layer, used an awl to puncture a series of holes, and thin but durable copper wire (resistant to breakage with use) to twisty-tie and secure the keys. The outer frame keeps the tray in place, and by undercompensating on the tray's inner scaffolding, the frame all sits evenly! The only issue I had with this frame was not having quite enough wire connectors on some of the smaller keys (causing them to swivel when moving the tray around), but that's an easy fix. Needless to say, both I, and the graduate were very pleased with the final product. I would estimate this price of this frame (9"x6") to be around $40 (not including the keys), but the price would very much depend on the dimensions. Last of all, wedding thank you's! The biggest Warren Tales request, to-date, went to a wonderful couple in California, this month. For a country wedding, we went with a simple and clean, but weathered aesthetic. 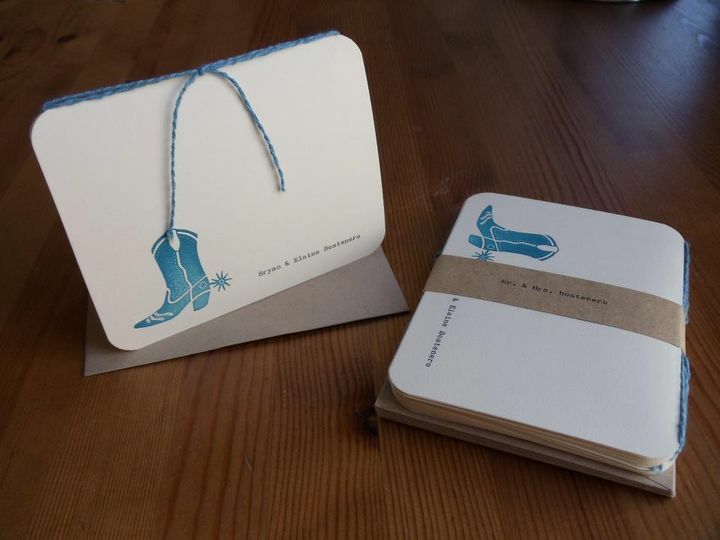 A smooth superfine soft white card with rounded corners, featuring the bride and groom's names typed (on a typewriter, of course) on the front and accompanied by a faded harbor boot stamp, as well as a light blue hemp yarn double-tie over the spine, tied with a knot (no pun intended, but always appreciated). 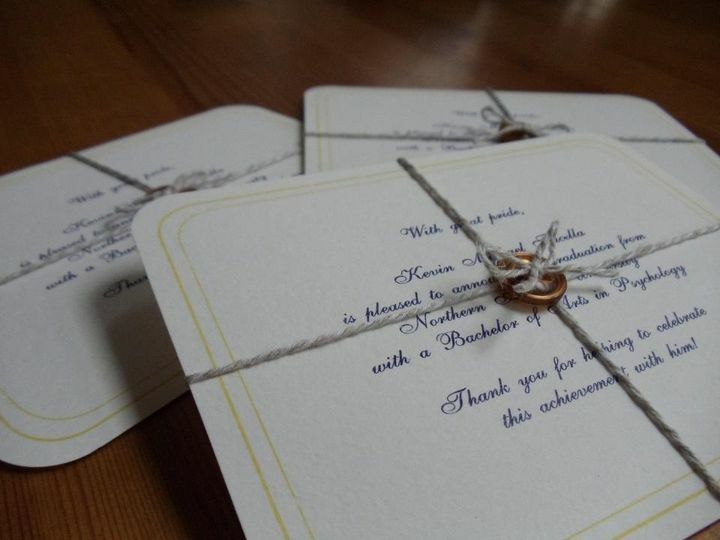 Each of these cards were paired with a paper bag envelope, and bound in bundles of ten with a personalized "Mr. & Mrs." wrap (also typed).